A mother, father, son and daughter make up this family of statues displayed at the Grand Pre National Historic Site in Grand Pre in the Bay of Fundy, Nova Scotia. Fourteen acres of gardens, statues, monuments and buildings create the scenic setting at the historic site. At the Grand Pre National Historic Site, visitors can learn of the Acadian settlement from 1682 to 1755 and the deportation of these people which started in 1755 until 1762. At the onset of the 18th century, Grand Pre had the largest individual settlement in Acadie and the village covered 2 1/2 kilometers consisting of houses, farmland, buildings, storehouses, windmills and a church. These statues are a reminder of how an Acadian family lived throughout these years in Grand Pre. 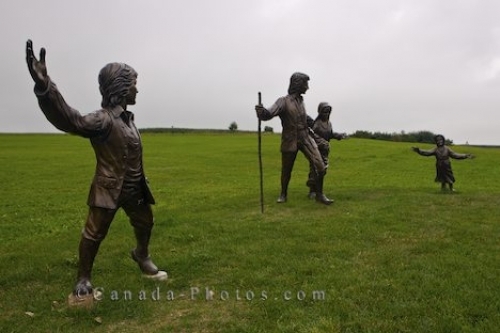 Picture of a family of statues at the Grand Pre National Historic Site in the Bay of Fundy in Nova Scotia, Canada. Family statues in a field at the Grand Pre National Historic Site, Grand Pre, Minas Basin, Bay of Fundy, Nova Scotia, Canada.